Synopsis: From the master storyteller, Aidan Chambers, comes this new thought-provoking novel for teenagers.Karl, aged seventeen, is hopelessly in love. But the object of his affections, Firella, demands proof, and poses him a series of questions regarding his attitude to the many sides of love. But Karl is dyslexic, and convinced that if Firella finds out, she will think he is stupid, and unworthy of her, and leave him.So Karl asks a local writer to help him construct his replies - and an unlikely, but extremely touching, friendship develops between the two men. They both come to learn a great deal about about life from a very different perspective, and when an act of violence shatters their calm, they find their respective appraisal of life shifting in profound ways. Like many boys, Karl will do anything to keep his beautiful girlfriend Fiorella. So when she issues an ultimatum to their relationship – answering some fifty questions that she has set him, he panics. Karl is dyslexic. In an attempt to satiate her desire, Karl turns to the next best person he knows who could answer them for him: Fiorella’s favourite novelist. What Fiorella doesn’t realise is that her ultimatum has begun something far more powerful and potent: friendship. In recent years, the bildungsroman or ‘coming-of-age’ novel has seen a rise in popularity in the YA market. However, tales of angst, love and enlightenment have more often than not been exclusively American, and British coming-of-age novels seem few and far between, with William Nicholson’s Rich and Mad being one of the more recent additions. In part, this is probably due to the British Stiff Upper Lip: nothing annoys us more than shouty, over-the-top entertainment, two which the bildungsroman tends to drift. However, there is something deliciously refreshing about a British coming-of-age novel: a laid back, cooler tone that doesn’t try to push its point or introduce hyper-real characters. Dying to Know You is just such a novel. Chambers takes the interesting (and nigh-on unheard of in YA) decision of narrating his novel from the perspective of a seventy-something old man, which lends the novel a somewhat slower quality than if it were narrated by eighteen-year-old Karl, who is fascinating as an intelligent (yet not academically intelligent) quiet, brooding strong young man who is trying to do his best for his new girlfriend, Fiorella, even if it means working through his dyslexia. The Old Man- well, he admits that in many respects he is very similar to Karl, keen on his own company- but his interest in helping Karl is a rather more self-serving reason: he thinks Karl can help him begin the creative process of writing a novel again. And perhaps this self-serving initiative isn’t so self-serving after all if he helps Karl through his troubles; one good turn deserves another. Fortunately, both our protagonists are sympathetic characters who are easily related to, and I enjoyed spending time with them whilst reading the novel. Creativity is not an unexplored territory in contemporary YA literature: John Green’s latest The Fault in Our Stars features a character called Peter van Houten to make the point that stories aren’t the possession of the author but rather of every reader; whilst William Nicholson also explores creativity in Rich and Mad, where a somewhat Dead Poets’ Society-esque John Keatings character exists to help out and question the protagonists romantic interests through the mediums of various creative processes. Dying to Know You, however, explores creativity for very different reasons of self expression, focusing a lot more on the subject than the aforementioned novels where it is used predominantly as a vehicle to explore a variety of other ideas. I have an affinity for dialogue heavy prose: I find that it is far more intriguing to unpick the characters through their own words rather than those of an “otherworldly” or omniscient narrator. Dying to Know You is written in such a style and I found it extremely suitable for such a character-driven novel where action set pieces are absent and ideas and identities take the foreground. 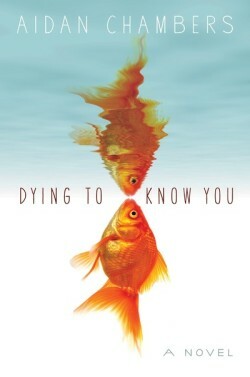 Dying to Know You is another welcome and enjoyable addition to the pantheon of British coming-of-age novels. Chambers deals with a variety of issues, including dyslexia and depression, in a sensitive and understanding way, though these are less the focus of the book than the catalysts of the story. Superbly written, and from a unique perspective, it’s worth the read (and at 288 pages, won’t cost you much time), particularly if you’re looking for something a little less sensational than other bildungsroman novels. What did you think about Dying to Know You? I really, really enjoyed this so I’m glad that somebody else has too! I’m really glad that you enjoyed this one! I’ve heard mixed reviews about this author’s work, but it’s great to see that you’re mostly positive. Great review!